Doing your website content planning with insights gained from SEO keyword software for research and competitive SEO analysis is a smart move. Here’s how you can tackle the task with help from some useful SEO tools, including Keywords Everywhere, Ubersuggest, and SEO PowerSuite’s keyword research and analysis software. Disclosure: This post contains affiliate links to SEO PowerSuite software products. I may earn an affiliate commission, at no additional cost to buyers, for purchases made via these links. I use SEO PowerSuite regularly and recommend it as an affordable SEO software option, regardless of how or where anyone may purchase it. Content planning is a component of overall content marketing strategy that may include both online and offline deliverables. Content can be as short as a tweet that reaches millions on Twitter, or as long as a 30-page technical white paper intended for an audience of one critical decision-maker at a major target B2B account (e.g., in the context of account-based marketing, or ABM). Marketing content includes images and graphics, infographics, audio podcasts, and of course lots of video. Content planning is a major component of marketing in general, and content marketing more specifically. It is a hugely important activity for digital marketing professionals. This post is focused on the SEO aspects of content planning, especially the SEO keyword research component and competitive analysis (related to ‘SEO difficulty’) for written website content, such as blog posts and more detailed primary site pages. Many online content producers, website content marketers, and bloggers just write about things they *think* will be interesting to their audience. Or they write about pet topics that personally interest them and are top-of-mind for them at the moment. But content production takes valuable time, so content marketers hoping to earn high rankings in search engines should do competitive SEO keyword research before committing to developing specific themes or pieces. This is especially true when the content marketer’s goal is to use website content to attract more website visitors and turn them into engaged readers, customers, and advocates. You want to create online content that will attract website traffic through organic search engine activity. You want more traffic from SEO. You have a specific subject area in mind that is directly related to the products and services you want to promote. You want to sell via great content. You have at least a basic understanding of the importance of search engine optimization (SEO) for content planning and marketing. You’re aware that good SEO planning helps your content rank higher, faster. So, website traffic growth through better SEO is our intermediate goal now, with some form of ‘conversion’ being the next goal: to generate an inquiry, make a sale, get a donation (e.g., non-profits), gain a new email subscriber, etc. We’ll use a combination of two free keyword research tools and SEO PowerSuite’s Rank Tracker program to help us decide on a content keyword focus for a hypothetical project. The free SEO tools used here are Keywords Everywhere and Ubersuggest. Then, in combination with the pro version of SEO PowerSuite, we’re going to evaluate the initial set of target keywords and look at SEO keyword difficulty… a measure of our ability to rank on Google Page 1 organic search results for one or more of these keywords. Along the way, we’ll cover portions of an SEO PowerSuite workflow for Rank Tracker, so this post provides some SEO PowerSuite training value as well. SEO PowerSuite is a PC-based software suite that handles the most common tasks of modern SEO. It’s arguably one of the best SEO tools for small businesses, due to its combination of functionality and affordability relative to many competitive SEO tools. SEO PowerSuite also offers a free version that is useful as an introduction to their software suite. We’ll use a hypothetical business scenario to illustrate the SEO process and supporting tools used below. Let’s assume we’re doing content development for ‘Smallbiz SEO Solutions’ – a hypothetical solutions vendor focused on SEO software tools for small-to-medium businesses. Smallbiz wants to generate more inbound website traffic via organic search. They want to spend more of their marketing time and effort in this area through inbound marketing tactics, and less resources on paid promotional channels such as PPC, paid social media, etc. For purposes of this post, our topic area is a sub-category of a larger overall product segment (SEO software). Since small businesses are our primary target audience, the more focused sub-topic is a ‘direct hit’ niche for us. We use SEO software in this example since it is directly applicable to this tutorial. But in general, the approach outlined below is applicable to any topic, product, or service focus. From an SEO planning perspective, it generally makes sense to focus down as far as needed to reduce SEO competition, while still addressing a large enough audience. In this case, the obvious base keyword for starting out is ‘seo software’. The broad keyword ‘seo software’ is likely to be very competitive in terms of keyword difficulty (explored later), so the more focused keyword ‘seo software for small business’ is another obvious alternative. It’s an example of a ‘long-tail’ keyword, vs. the short-tail base keyword. We’ll discover and explore other keyword ideas as well, but this is a good starting point. For a baseline view, let’s look at the less specific keyword (seo software) in Google. Note the Keywords Everywhere data inserted below the search box. This free keyword research feature is available via browser extension. I’m using it with Chrome in this case. This data comes from the Google Ads (PPC/CPC) keyword planning tools. It is useful initially for estimating monthly search volume and getting a sense for PPC costs and competition level. We also see similar Keywords Everywhere data from the Google Autocomplete function below. This can help us identify good related keywords that are longer-tail extensions of the base keyword. 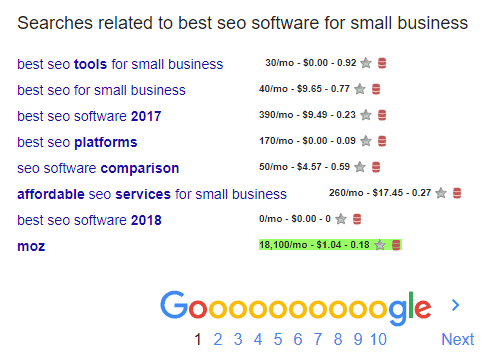 The keyword ‘best seo software for small business’ has an OK search volume (480/mo) with pretty high PPC cost ($12.37) and PPC competition level (0.92, where 1 is the max). It’s an indication that this keyword has commercial value (ROI) for vendors who are bidding on it. They are willing to pay over $12 per click since this traffic converts reasonably well into paying customers. Now let’s take a closer look at this more focused keyword. By the way, the green highlights in the Keywords Everywhere data are simply a result of my settings for that browser extension. Any keyword with volume > 1000/month and competition < .5 will get the green highlight in my current settings. These are easy to change at any time. You can also include CPC values in this highlighting logic. 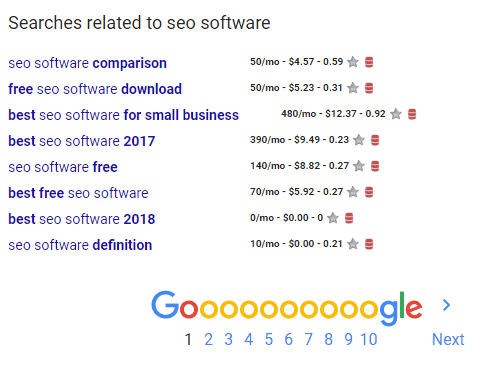 Note the difference in search volume for ‘best seo software for small business’ (480/month) vs. ‘best seo tools for small business’ (only 30/month). It’s an order-of-magnitude difference, and we might not have guessed that without doing this level of keyword research. We also see that there’s going to be a difference between seo software and seo services related keywords and search intent. 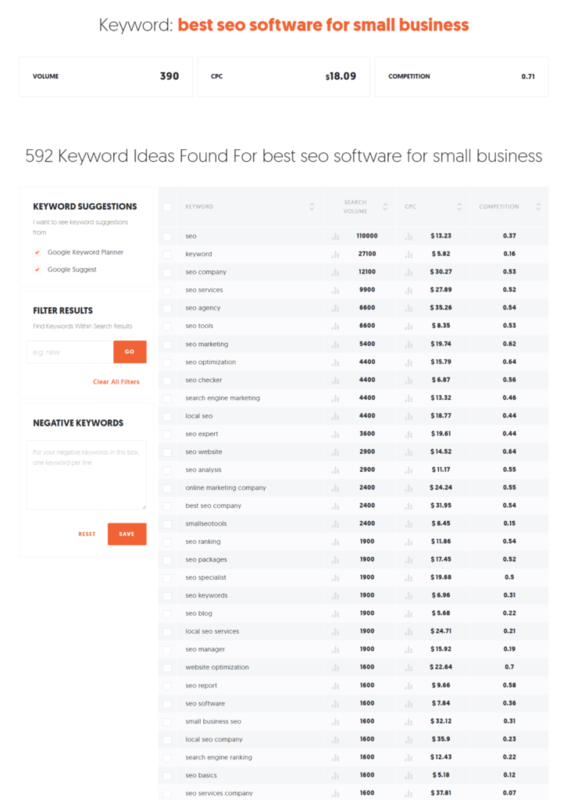 The Keywords Everywhere table below is for the ‘best seo software for small business’ search. Ignoring the green highlights for now, we can see here that ‘seo reporting software’ (fifth keyword from the top) may also be an interesting keyword variant for us. Now using the free keyword research tool at Ubersuggest, we see the following. The Ubersuggest keyword research tool accesses data from the Google Keyword Planner (AdWords tool) and/or Google’s search suggestions. It also allows filtering, using negative keywords, and exporting to CSV files. The data produced here for ‘best seo software for small business’ is different than what we got from Keywords Everywhere, so we now have a range of data to consider. But we’re still looking at a search volume of multiple hundreds per month, so we’re still OK there. There are many SEO keyword research tools and methods available, both free and paid. 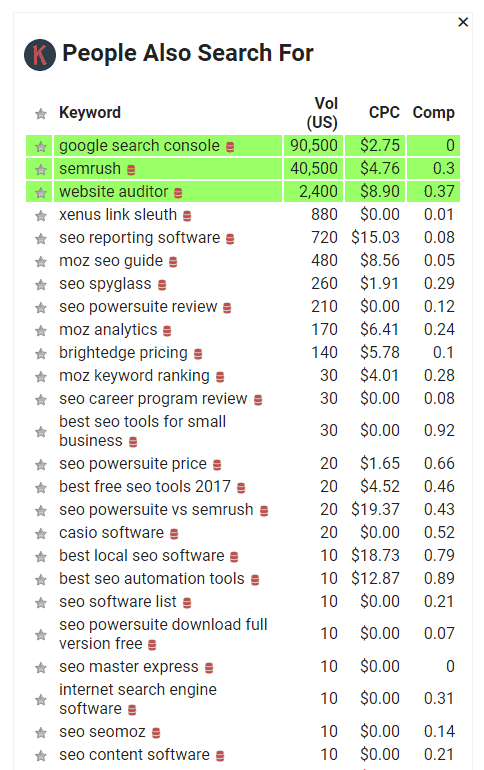 SEO PowerSuite has several keyword analysis tools and methods built directly into Rank Tracker, and I recommend exploring and using these as well. In most cases, Rank Tracker is a great place to start for initial keyword analysis. This tool provides many research options organized into the seven areas shown below. This is your point of entry into SEO PowerSuite’s keyword research and keyword difficulty scoring features. Ranking Keywords – Uncover keywords for which a specific website domain or target page ranks. Useful for checking your own or SEO competition’s ranking keywords. Can focus on desktop or mobile rankings. Keyword Suggestions – Find keywords with help from Google’s AdWords Keyword Planner, Keyword Discovery, or Yandex Wordstat. Enter seed keywords, select target country and language. Autocomplete Tools – Includes keyword autocomplete and search suggestions lookup for Google, Bing, Yahoo, Amazon, YouTube, Ask, and Yandex. Enter seed keywords and select target language. Related Searches – Includes related searches for Google, Bing, or Ask, based on your seed keywords entered. Domain Research – Options here include Google AdWords by target page, Google Search Console, Google Analytics, and competition TF-IDF Explorer. SEO PowerSuite allows you to connect your own Google Search Console and Google Analytics accounts to their software tools, for more complete keyword research and analysis options. Related Questions – A keyword research method that finds related questions based on your seed keywords. Includes several target language options. Keyword Combinations – A keyword tool that uses word mixer, word combination, and misspelled words to identify new and potentially useful SEO keywords. All of these keyword research options include the ability to specify negative keywords. This is very useful for eliminating keyword variants that you know you won’t want to target. It’s completely free to get started with SEO PowerSuite. The suite of four software applications goes well beyond keyword research and analysis, keyword difficulty, rank tracking, and reporting. It includes applications for performing technical SEO website audits, competitive backlink profile analysis, and link-building analysis and outreach as well. I use the professional (paid) version of SEO PowerSuite currently, and am generally very happy with it. The company provides helpful product tutorial and training content on their blog, as well. They do a good job of explaining essential SEO concepts and how the SEO PowerSuite software tools address these needs. However, using multiple keyword research tools can help. In some cases, Keywords Everywhere and Ubersuggest will provide more granular estimates vs. SEO PowerSuite keyword software (Rank Tracker) in terms of estimated monthly keyword search volumes. As we’ll see later, SEO PowerSuite puts the range at 100 – 1K monthly searches for ‘best seo software for small business’, whereas Keywords Everywhere shows 480/month and Ubersuggest shows 390/month. This may be because my Google Ads account, which I’ve connected to Rank Tracker for keyword research purposes, is not currently running live ads. So, Google is limiting the granularity of search volume data available to my installation of Rank Tracker. Users who have active Google PPC campaigns running may see more precise keyword volume data provided by SEO PowerSuite. I appreciate the extra detail I get from Keywords Everywhere and Ubersuggest while doing keyword research. These and other keyword analysis tools may simply have more in-depth access to Google’s Keyword Planner data. All other things equal, I’m much more interested in a keyword that shows 750 searches per month than I am in a 110/month keyword. But both might show only the same 100 – 1K range in SEO PowerSuite. This is one reason why using different SEO keyword software tools for research is a smart move when doing content planning. Should You Use SEO PowerSuite Rank Tracker? I started this keyword research example with free tools from Keywords Everywhere and Ubersuggest. But, I still recommend using the SEO PowerSuite keyword research and analysis features in Rank Tracker. SEO PowerSuite’s keyword research, organization, and workflow features are very useful, even with the potential search volume granularity issues noted above. The SEO tools below may also be helpful, either alone or in combination with SEO PowerSuite. In fact, I like to import new keyword ideas from Google Search Console and other free tools into Rank Tracker. This allows me to consolidate and track everything within SEO PowerSuite, which is great for my SEO project management. Focus only on the keywords with ‘sufficient’ monthly volume for your needs. In this specific niche example, we’re looking for 100 – 1000 searches per month, preferably toward the high end of this range. And then simply bring these keywords from other sources into your SEO PowerSuite Rank Tracker project for further analysis (see below). Don’t forget to also check Google Trends for additional keyword insights over time and by regions of the world. Data from Keywords Everywhere will also appear here, if you have it installed and activated as a browser extension. OK, so we’re done with Step 3 and are still interested in ‘best seo software for small business’ as our main keyword. This keyword is directly aligned with our company’s target market segment or niche / sub-niche. We’ve noted the search volume estimates and the PPC data from various keyword research tools. We think the search volume is high enough to make this an interesting target for new content planning and development. But, is it possible to compete in the organic search results for this keyword? Let’s find out below, turning again to SEO PowerSuite Rank Tracker for help. 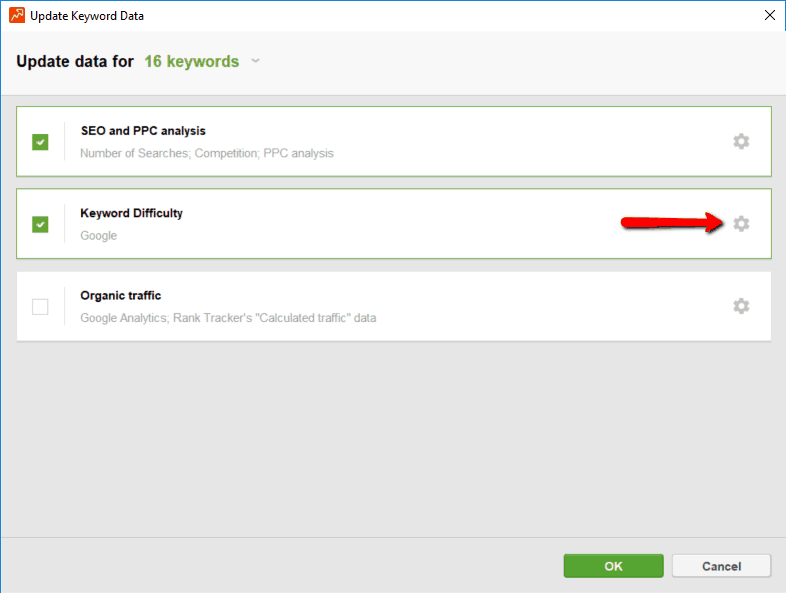 We’ll be using SEO PowerSuite keyword difficulty tools at this stage. Keep any good keywords that you’ve already identified in Rank Tracker’s keyword research module. Delete keywords that aren’t serious candidates for further efforts at this stage. And then add those discovered outside of Rank Tracker via other tools and methods – e.g., using Keywords Everywhere and Ubersuggest as shown above. Use either the Target Keywords >> Keyword Map or Target Keywords >> Rank Tracking areas to manually add these external keywords into Rank Tracker. Just look for the green circle with the “+” symbol. For all keywords that are still in your ‘research’ phase, add them to a Keyword Group with your custom naming applied. Something like ‘seo software kw research’ in this case. Do this even for keywords that are part of the Target Keywords module, even if you think you may discard them later. 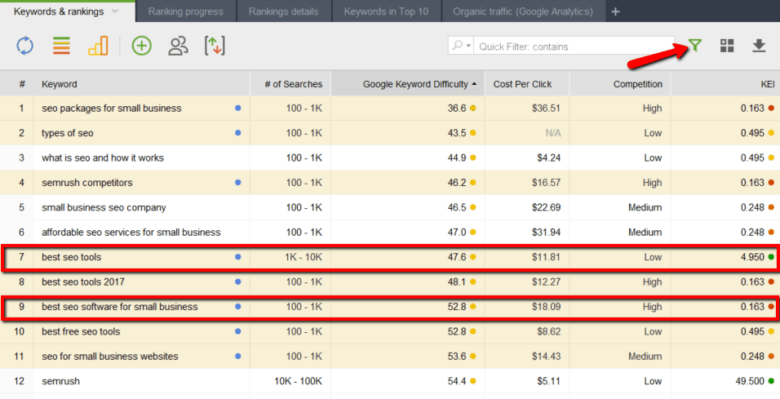 Similarly, you can add custom tags to these keywords in Rank Tracker. Doing either or both of these will come in handy later when you want to filter on specific keyword groups or tags in Rank Tracker. This is very helpful during the content research and keyword prioritization phases. This is also now a good time to update PPC/SEO data for the entire set of keywords. Most importantly… Also be sure to update the Keyword Difficulty score. For driving organic search traffic, we’re interested in this much more so than the PPC data. Be sure to select / highlight all the keywords you want to run the task(s) on. Otherwise, you may accidentally run the task on only a single keyword. I didn’t check organic traffic here since I’m in research mode for new content and the target website doesn’t have any traffic coming in yet via these potential keywords. 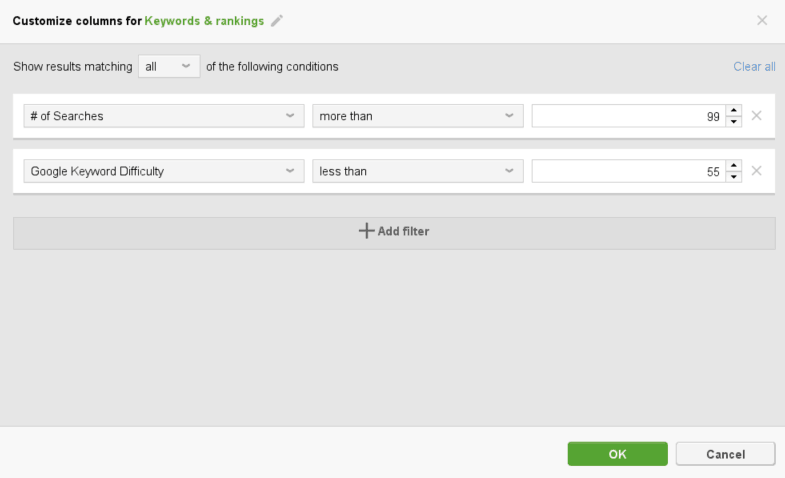 In the Rank Tracking module, look at combinations of search volumes and keyword difficulty to see which keywords look attractive for your organic SEO content development efforts. Note that the Cost Per Click, Competition, and KEI numbers are based on Google’s pay-per-click (PPC) data, and so are not important for us when looking into organic search competition / difficulty scores. Then using the filter / funnel icon in the upper right of this screen, we build a simple custom filter to narrow down the list by search volume and keyword difficulty. We define the filter to match all conditions set below. Row 9 shows the data for our target keyword: best seo software for small business. Row 7 – best seo tools – also looks potentially interesting since the search volume is up to 10x greater and the Google Keyword Difficulty looks reasonable. SEO PowerSuite’s ‘Keyword Efficiency Index’ (KEI) figure is also good for this keyword, though this number is calculated from PPC data, not the organic search competition. I’ve also added a blue dot ‘color marker’ to several of these keywords. They may be good candidates for including in the keyword planning as long-tail or semantic related keywords. Adding color markers and tags to groups of keywords can be really helpful for keeping keyword analysis projects organized. This is definitely a strength of SEO PowerSuite’s keyword research capabilities. I find it to be a helpful part of my own SEO PowerSuite workflow. 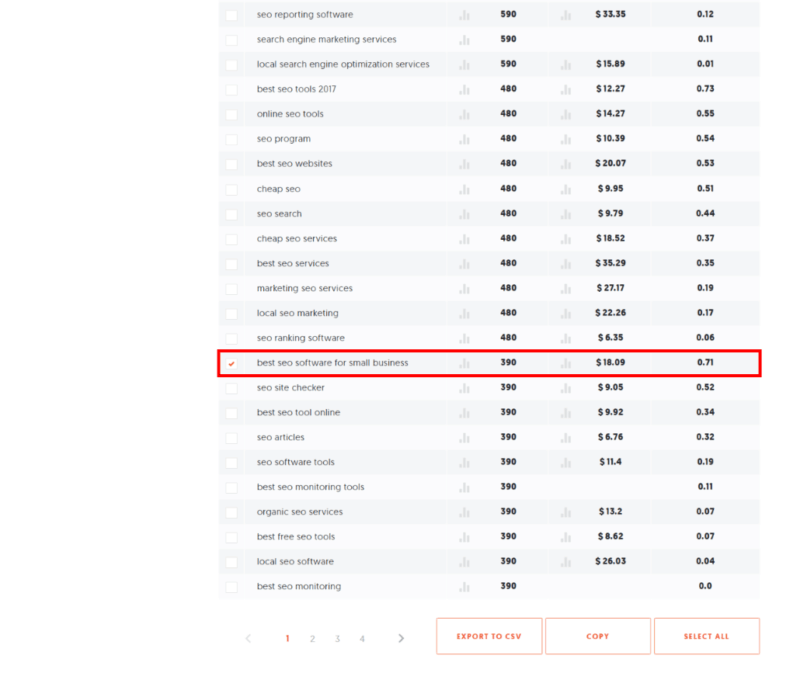 We also see references to semrush in the table above. SEMrush is a popular brand of SEO software. It may make sense in this case to incorporate ‘semrush competitors’ and similar keyword variants (such as Moz-related keywords) in our content planning and copywriting. Once we’ve identified a leading keyword candidate (and possibly a few variants or supporting keywords), it’s time to use SEO PowerSuite’s keyword difficulty features to take a closer look at the organic search results for each. For example, see the results below (sorted by rank) for the simple base keyword we started with: seo software. Based on this set of ten competitive search results, the overall keyword difficulty (in Google) is 71.9. That’s pretty high, and we can see why by looking at the component scores. InLink Rank is basically a ‘page authority’ score based on incoming link metrics, including quantity and quality of external and internal links. It’s designed to be similar to Google’s PageRank scoring method. Domain InLink Rank is an extension of this, applied across the entire domain. It is therefore similar to a ‘domain authority’ score. From a competitive standpoint, greenish dots here are *not* good. This means high authority scores for these pages and domains, and therefore high (orange/red) keyword difficulty scores for any hopeful SEO competitors who want to displace them. It looks like it could be pretty tough to rank on page 1 of the Google SERPs here. The only exception is position #4… a relatively weak page at business.com. They must have pretty good on-page SEO in order to earn that spot. Now let’s look at the same table for our more focused, long-tail keyword: best seo software for small business. In this case, the overall keyword difficulty score has dropped to 52.8. Much better than the 71.9 keyword difficulty we saw above for the ‘seo software’ keyword! And we see why by looking at the individual scores. It looks like positions 1, 8, 9, and 10 are potentially beatable, so we have a better shot at ranking on page 1 of the Google SERPs with this more focused, long-tail keyword. This is the basic reason why SEO professionals always preach about targeting longer-tail keywords (or key phrases) these days. It’s just more achievable to rank higher for keywords that are more ‘niche’ and sub-segmented vs. the shorter and more competitive keywords. The objective is to find ‘winnable’ keywords that have sufficient search volumes from an appropriate target audience, and with low enough keyword difficulty scores. Software tools like SEO PowerSuite’s Rank Tracker allow us to easily see what pages are ranking for a variety of keywords and how they score in terms of competitive SEO keyword difficulty. Now we need to directly review the top 10 results ourselves (‘with our own eyes’) and get a more direct sense for how we can compete. In Rank Tracker, we simply hover over the link we want to visit and then click on the gray curved right arrow that appears (not shown above). This opens a new browser tab with the page displayed. We will do this for all ten results to get a good visual sense for the content competition. We should pay extra close attention to the low-scoring pages (positions 1, 8, 9, 10 above) to see how beatable these pages might be. For the example above, we see that the #1 page at mainstreetroi.com is a blog post titled ‘The 13 SEO Tools Every Small Business Should Be Using’. It’s a decent summary post with brief descriptions of several SEO tools (and links), but it’s not really remarkable in terms of length, comment stream, social sharing evidence, etc. It does earn a ‘featured snippet’ ranking in Google (effectively claiming the top *2* spots), so it clearly scores well with Google in terms of on-page SEO. In a similar fashion, we’ll review all ten of the Google page 1 listings to assess our ability to compete for this particular keyword. Content structure – what kind of page or post is it? Is it well structured? Content length – what is the word count of the competing page or post? Images and graphics – how many, how good, etc.? Freshness of content – is the content dated or very new? Engagement – how many comments, how recent, etc.? Overall content strength – all things considered, is it a GREAT piece of content? Is it really a high-authority piece on this topic? The key question to ask is: Can we produce fresh content that will beat some or all of the Page 1 competition for this keyword phrase? This short SEO PowerSuite training video does a good job of explaining the keyword difficulty analysis tool built into Rank Tracker. Note that the software user interface is not quite the same today as what is shown in the video, but the concepts and discussion are still valid. At this point we’ve done keyword research and analysis using a few good SEO keyword software tools as part of our overall content planning. We’ve narrowed it all down to one main focus keyword and identified some related keywords of interest. We’ve used SEO PowerSuite’s keyword difficulty features for our target keyword, and we’ve done a manual visual review of the current top 10 search results. We’re convinced that we can compete against the competitive content already available, putting us in position to earn our way onto Google’s page 1 for this search term. The SEO keyword research phase of our content planning is almost over. We’re ready now to start developing content around the topic of our target keyword (and its supporting keyword variants, e.g., long-tail and semantic variations). Content development is a major topic all by itself, and is not the primary focus of this post. But I’ll offer a few basic suggestions below. Create a rough outline first. What are the topics you need to cover, and in what general order? Start fleshing out a rough first draft. Just write in chunks, don’t worry about formatting, clarifications, or flow yet. Stitch it all together and beautify it later. Keep your keywords in mind. Write naturally for the human reader, but of course include your target keyword, long-tail variants, and other related keywords you identified previously. Keep your writing as natural as possible and avoid any temptation to stuff keywords where they don’t fit naturally, or interrupt the flow. Don’t forget to include appropriate images and graphics, with ‘alt text’ tags filled in appropriately. Also think about multimedia content. Would an embedded video work here too? Or an audio podcast? What else can you include that will keep your reader engaged and on the page? For a wealth of great guidance in this area, see the resources at Copyblogger and the Content Marketing Institute. 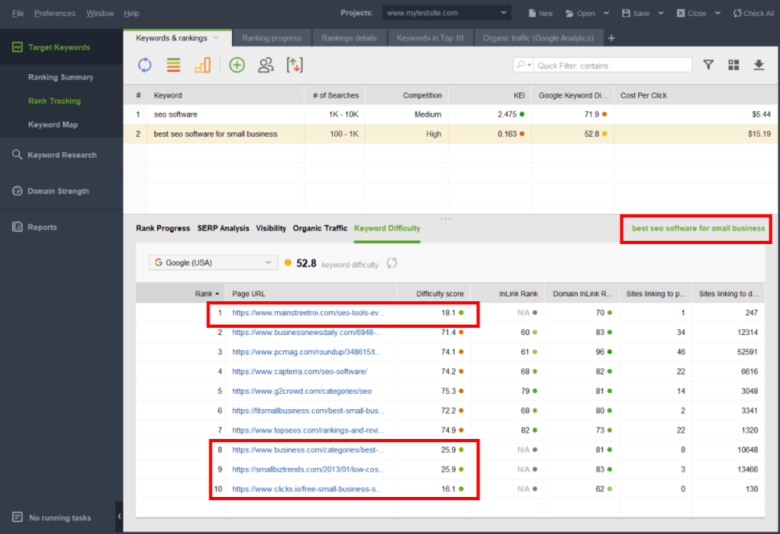 The WebSite Auditor application within SEO PowerSuite provides very helpful content analysis tools, including page-specific audits for content optimization and technical factors. WebSite Auditor also includes TF-IDF analysis for content optimization around your selected target keywords. This helps ensure that you’re not ‘keyword stuffing’ in your body copy, headers and sub-heads, image alt text fields, etc. SEO keyword research and analysis is really a fundamental part of online marketing content planning. It’s a ‘must do’ for marketing content that is designed to attract new visitors from organic search results. 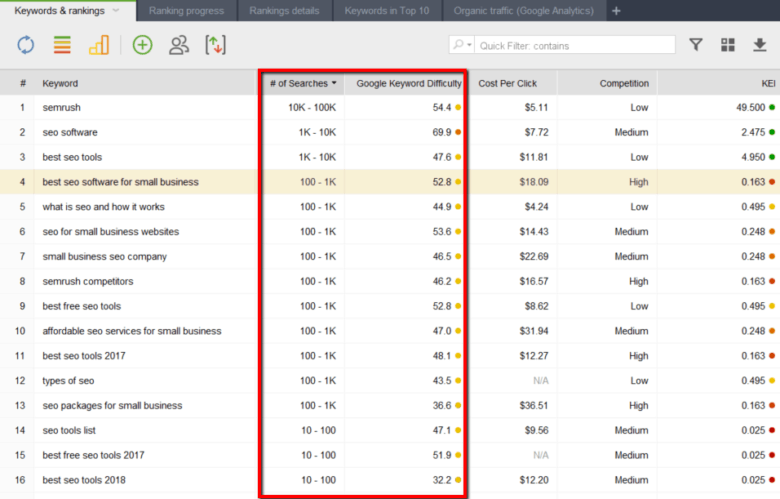 Attention to keyword difficulty and competitor content quality can really pay off here. Content marketers have many SEO tools at their disposal for this activity. Some are free and some are paid (e.g., ‘freemium’ SEO software). The best SEO software tools offer training, tutorials, and workflow guides to help new users get up to speed. In my example workflow above, I recommend using some of the free keyword research tools available, but then consolidating and organizing all work into a more comprehensive SEO software suite… in this case, SEO PowerSuite. SEO PowerSuite’s Rank Tracker has a number of useful keyword research options and excels in the area of organizing the keywords into target groups, helping you identify and stay focused on your best target keywords. SEO PowerSuite’s WebSite Auditor application helps with extensive analysis for on-page content optimization and overall website improvements. SEO PowerSuite also performs keyword difficulty analysis for specific keywords (or groups of keywords) based on the competitive content that appears on page 1 of Google Search. This really streamlines the process of analyzing competitive content and making smart choices about which keywords to pursue in your own content planning and development. Other free SEO resources from Google and free SEO keyword tools like Keywords Everywhere and Ubersuggest will also be a big help. I hope this overall workflow (and mini tutorial on SEO PowerSuite) makes sense and is of value to website content developers, especially those who may be new to the SEO considerations involved. Remember that the best SEO software solution may be to combine more than one tool into a workflow that suits your specific needs. If you need help with SEO or just want to discuss how to do search engine optimization, send me a quick note via my contact details. Over to you now. Please add your thoughts in the comments below. Thanks for reading… and sharing with your social networks, too.